For the past 2½ years, NHDES’ focus in this investigation has been to identify immediate receptors who might be drinking contaminated water, and get them an alternate water source, primarily through a connection to a public water system. While the work to extend several public waterlines is under way, we are also focused on Saint-Gobain Site Investigation activities. This post is the first of several describing the Site Investigation activities that are set to take place in the areas around the Saint-Gobain facility. A Site Investigation is a process to determine the source, nature, location and extent of contamination, and to identify receptors and potential receptors. Essentially – where did the contamination come from, and where is it going? This process involves identifying potential locations at a site where releases to the environment may have originated; collecting samples of soil, groundwater, sediment and surface water for laboratory analysis; and measuring groundwater levels to understand where groundwater is flowing. In New Hampshire, this process is established under NHDES’ Rules for Contaminated Site Management (Env-Or 600). This work must be completed with oversight by a licensed Professional Geologist or Engineer, with NHDES reviewing the work. What will be happening at the Saint-Gobain facility? Saint-Gobain has hired an environmental consultant, Golder Associates, Inc., to help them complete the Site Investigation, both at the Saint-Gobain property and the abutting properties that were previously owned by ChemFab (Saint-Gobain’s predecessor), which are located at 685 and 703 Daniel Webster Highway. The work will include the collection of soil samples, installation of monitoring wells (shallow, deep and bedrock), and collection of groundwater samples in areas of potential releases. The field work is planned to begin this week and will take several weeks to complete. 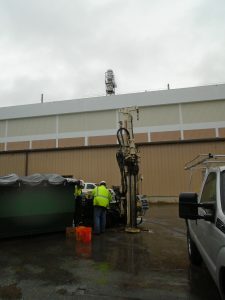 In addition to the air emissions source, Saint-Gobain identified other potential release areas that will be investigated, including areas where spills have occurred, chemical and waste storage areas, sanitary and storm sewer lines, former drain lines, current and former loading dock areas, and former railroad tracks. 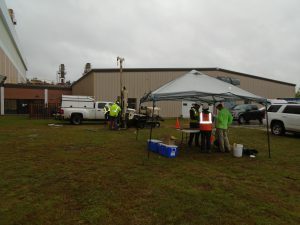 Saint-Gobain continues to sample the monitoring wells at their facility on a quarterly basis to understand how the PFAS levels in groundwater are changing over time. 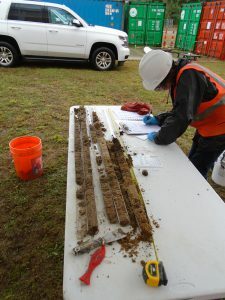 NHDES issued a comment letter on the work plan and addendum, with additional items to be considered in the work: http://www4.des.state.nh.us/IISProxy/IISProxy.dll?ContentId=4733860. Once the source(s) are identified, additional phases of work may be needed to delineate the extents of contamination (both lateral and vertical), including in the larger area around the site. A Remedial Action Plan will then be developed to describe what can be done to address the release(s). We anticipate that eventually a Groundwater Management Permit (GMP) will be issued for the site, which establishes a Groundwater Management Zone and will require long-term monitoring and evaluation of the effectiveness of any remedial measures implemented.